It resembles rather a chateau than a castle. Also, the Czech name is zámek Litomyšl and the word zámek is usually translated into English as “chateau”. However, in the official presentation in English, it is referred to as a “castle”, and as such it was inscribed on the World Heritage List. Therefore, the same word is used in this article. Getting to Litomyšl Castle is easy. The town of Litomyšl is quite small, and as you can see on the map above, it’s only a very short walk from the train station to the castle. The station in Litomyšl has several connections per day from Choceň and Vysoké Mýto. If you would like to go there from Prague, the train journey with stops takes about 2 hours 20 minutes one way, when using the fastest connections. If you change to a bus line in Česká Třebová or Pardubice, you will have additional options. 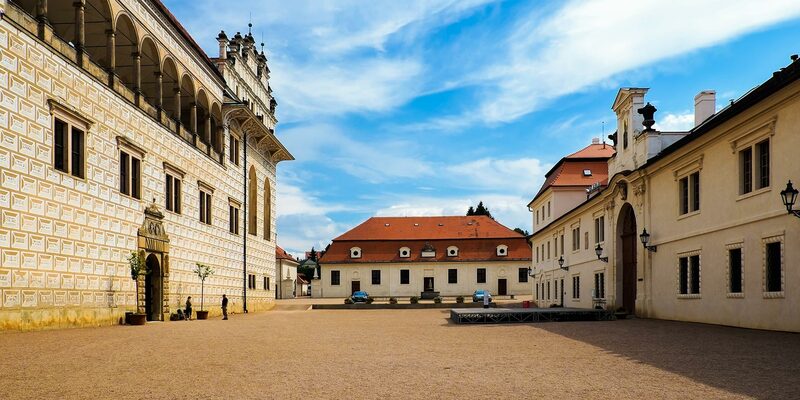 Therefore, Litomyšl is quite a good place for a day trip from the Czech capital, especially if you’re into visiting World Heritage Sites. This website offers a convenient way to check the timetables (there is an English language version, too). Thanks to historical documents, it is known that there had been a medieval castle on the site of Litomyšl Castle. In the 16th century, Vratislav of Pernštejn acquired the castle and decided to rebuild it in the Renaissance style. The architects were Giovanni Battista Aostalli und Ulrico Aostalli. The castle was completed in 1581, after 13 years of construction work. The aristocratic family of Trauttmansdorffs (Trauttmansdorffové) acquired the castle in 1649. They redesigned some of the castle’s interiors in the Baroque style and the work was conducted by Franz Maximilian Kaňka. In 1758, the Waldsteins (Valdštejnové) became the new owners and their contribution was the castle family theatre. The famous Czech composer Bedřich Smetana was born in the castle’s brewery in 1824. His father served as a brewer at the court of the Waldsteins. Nowadays, Litomyšl Castle is owned by the Czech state. 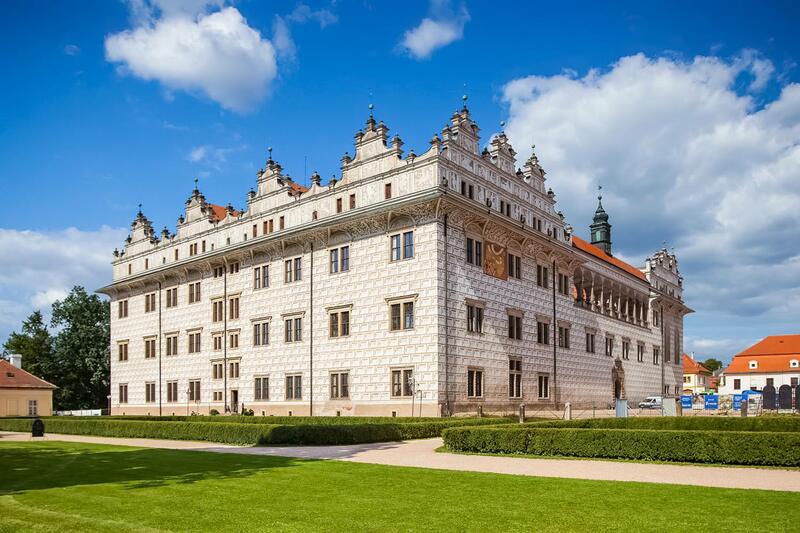 It is a fine example of a Renaissance arcade castle and one the greatest tourist attractions in the Pardubice Region. Hotel Zlatá Hvězda is a very good 3-star hotel in the centre of the town. The castle can be reached after a 10-minute walk. The excellent location and good value for money mean that the rooms are in high demand, so booking in advance is recommended. Check the availability and book your room. Hotel Aplaus is another popular accommodation option in the historic centre of Litomyšl. It is a 4-star hotel occupying three interconnected old buildings. The castle is within walking distance. The hotel boasts very stylish rooms, which are very popular among visitors coming to Litomyšl. Booking well in advance is recommended, otherwise there might not be any vacancies. Check the availability and book your room. Pension Paseka is a very good guest house in the centre of Litomyšl. It is an attractive alternative for those on a tighter budget. Because of its excellent value for money and great reviews, it is usually sold out. Therefore, booking well in advance might be necessary, otherwise there will be no vacancies. Check the availability and book your room.